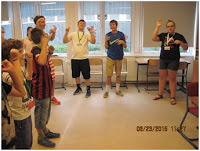 We hope you enjoy these pictures of our English camps. Thank you for your prayers of support. May the Lord bless you as you serve him. (Left) Kickball was new to some at the Teenage Camp. (Right) Whitley and Donna are helping out a camper with his picture frame in crafts. Donna and Mike taught the Bible stories during the second camp. (Left) Barnanne kept the campers moving as she imparted Biblical truth during recreation. (Right) This is Jerry and Susan’s 7th year of teaching the Bible stories at Children’s Camp. We are very thankful for their leadership. the afternoons also prompted spiritual questions during both camps. songs with the younger kids. 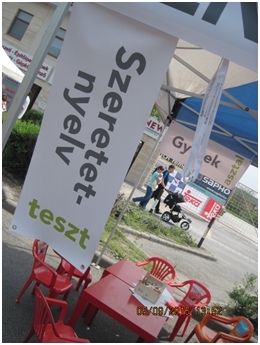 During a recent festival in Budaörs, our church set up a tent and invited people walking by to come in to take a love language test. It was a chance for our members to introduce folks to the church and talk about Jesus. This picture was taken in a small town near us. 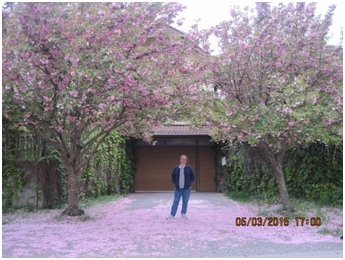 I couldn’t resist showing the beautiful flowering trees there. 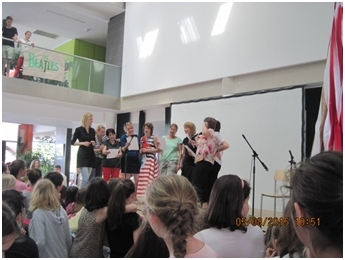 Mike and I were asked to judge a Beatles competition in Kinga’s school in Budaörs. 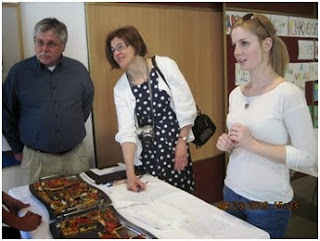 Here she is on the far left, singing a Beatles song with her fellow English teachers. The competition, however, involved only English students in grades 5-8. 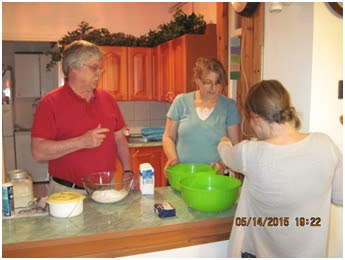 Before our Bible study began, Mike shared a pie crust recipe with Erzsi and Judit. A yummy new pizza was introduced to an elementary school in Törökbálint in April. Mike and I were invited by Krisztina to watch her marketing students (some of our English students) as they prepared their new sardine-topped pizza for sampling among the kids and their parents. The high school students from the Bálint Márton School asked that those participating fill out questionnaires about the new food item. These were collected, tabulated, and made into a class presentation. Mike and I were asked to check the written part of the presentation for English mistakes. This was a fun way to help students and meet new people. We are grateful for our friend Zoli, who secured locations for the two camps we will have this summer. Please pray for faithful friends from North Carolina who will minister with us. 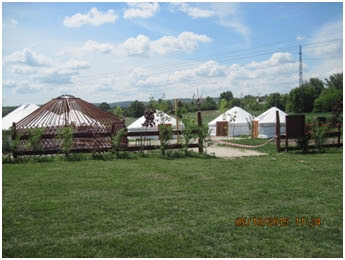 Our first camp in Budaörs will be for children. The second camp will be for teenagers, and it will be located in Törökbálint. Our desire is that those who come will clearly hear the Gospel and make decisions that will honor Christ. Mike and I had a very good time in the States this month with our family and friends. We are grateful to those who let us use their vehicles to travel many, many miles in Virginia, North Carolina, Tennessee, Kentucky, and the District of Columbia. Thank you for housing us at various times. We got to help Papaw put a complicated puzzle together (it still is not completed), hear a beautiful hand bell choir directed by my sister-in-law, and finalize summer plans in Budapest with a partnering church. We spent time with Alexander during his spring break, went shopping with Rebecca, saw where Robert works on army helicopters, and lavished hugs and kisses on our grandchildren. This was our first time meeting our new granddaughter, Haley. I had a wonderful time talking with my mom (who likes bacon by the way 😉 , and being with my brothers. Spending the day in D.C. in the cold and wind, walking 12 miles around the city with our friends was also a good thing. Listening to Mike as he struck up conversations with waiters, people on the subway, and people at the airport, hoping to have those important spiritual talks, was a lesson in humility for me. It was a good trip. We are grateful that we were able to meet with the students at the school before their spring break this month so we could share the Easter story. 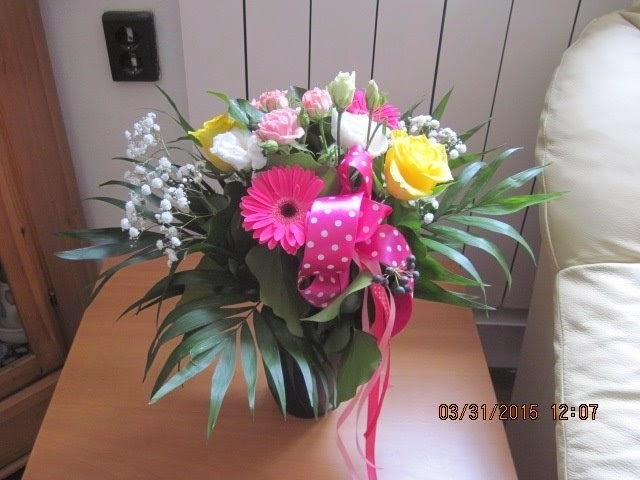 Today when we arrived at the school, the English teachers surprised me with a bouquet of flowers for my birthday. Hence, the picture I sent. When we walked into one of our classes, the students sang Happy Birthday to me. I was overwhelmed. I was blessed also by birthday wishes from colleagues, and family and friends in the States as well. One of the happiest feelings we can have is to know we are loved, and I certainly feel that I am loved. God loved all of us so much that He even gave His son to die. Then God raised Jesus up. What a Resurrection Sunday! Pass the story and His love on to others you meet. Thank you for praying for us and the people we are in contact with each day. It is always a delight to see non-believers react when we tell them that prayers are being lifted up for them by people who do not know them. They don’t understand such concern and love, but they do appreciate that others care about them. Others that you might take the time to pray for are our IMB colleagues in Hungary. They serve in many areas, from logistics to gathering people together who are raising children with special needs, to those personnel who mentor church pastors. I know they would appreciate it. Each week when we go to the school, we have new opportunities to share God’s Word. Last week, Mike and I talked about Nature with one of the classes, and we were able to share Psalm 8. Can you imagine that some of the students and teachers have never opened a Bible to read anything from it? It’s a great way to teach new vocabulary and an even greater way to let them see and read the Word. “K” came to Bible study this past Thursday night. Our story was from Matthew 18: 21-35-“The Parable of the Unmerciful Servant.”(NIV) She read out loud to the group. Her only question concerned the seventy times seven. What does it mean? How would you have answered her? “A” is a carpenter who lives in our city. 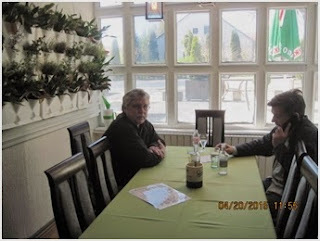 He and Mike spend time each week going over his English lessons from the school he attends in Budapest. Please pray as Mike imparts eternal truth along with English.